For the individual settlement, see Walsall. 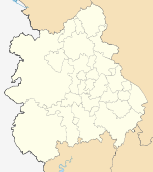 The Metropolitan Borough of Walsall is a local government district in the West Midlands, England, with the status of a metropolitan borough. It is named after its largest settlement, Walsall, but covers a larger area which also includes the towns of Aldridge, Bloxwich, Brownhills, Darlaston and Willenhall. The borough had an estimated population of 254,500 in 2007. The current boundaries were set as part of the provisions of the Local Government Act 1972, with a change to the north of the borough in 1994. It is bounded on the west by the City of Wolverhampton, the south by the Metropolitan Borough of Sandwell, to the south east by the City of Birmingham, and by the Staffordshire districts of Lichfield, Cannock Chase and South Staffordshire to the east, north and northwest respectively. Most of the borough is highly industrialised and densely populated, but areas around the north and east of the borough are open space. In 1986 the borough became an effective unitary authority when the West Midlands County Council was abolished. However it remains part of the West Midlands for ceremonial purposes, and for functions such as policing, fire and public transport. The residents of the Metropolitan Borough of Walsall are represented in the British Parliament by Members of Parliament (MPs) for three separate parliamentary constituencies. Since the 2017 General Election, Walsall North has been represented by Eddie Hughes MP (Conservative), Walsall South by Valerie Vaz MP (Labour) and Aldridge-Brownhills by Wendy Morton MP (Conservative). The borough is part of the West Midlands constituency in the European Parliament. The West Midlands region elects six MEPs, as at 2009 made up of two Conservatives, one from the Labour Party, one Liberal Democrat, and two members of the United Kingdom Independence Party. Both UKIP MEPs have since left the party. In 1974, Walsall Metropolitan Borough Council was created to administer the newly formed metropolitan borough. Elections to the council take place in three out of every four years, with one-third of the seats being contested at each election. Between its formation in 1974 and the 2003 election, the council varied between control by the Labour Party, and where no one party had an overall majority. From 2003 to 2011 the Conservative Party then held a majority of councillors. However at the 2011 election the Conservative Party lost five seats, while Labour gained eight, and afterwards no party held a majority. The Metropolitan Borough of Walsall is based on an amalgamation of two former local government districts, Walsall County Borough and Aldridge-Brownhills Urban District. At the time of the United Kingdom Census 2001, according to the Office for National Statistics, the Metropolitan Borough of Walsall had a total resident population of 253,499, of which 123,189 (48.6%) were male and 130,310 (51.4%) were female, with 101,333 households. The Borough occupied 10,395 hectares (40.14 sq mi) at the time of the 2001 census. Its population density was 24.39 people per hectare compared with an average of 28.41 across the West Midlands metropolitan county. The median age of the population was 37, compared with 36 within the West Midlands metropolitan county and 37 across England and Wales. The majority of the population of the Metropolitan Borough of Walsall were born in England (91.77%); 1.42% were born elsewhere within the United Kingdom, 0.82% within the rest of the European Union, and 6.00% elsewhere in the world. Data on religious beliefs across the borough in the 2001 census show that 72.1% declared themselves to be Christian, 10.0% said they held no religion, and 5.4% reported themselves as Muslim. Whereas in the 2011 Census 59% declared themselves to be Christian, 26% said they held no religion or did not state their religion, and 8.2% reported themselves as Muslim. Within the Metropolitan Borough, 42.84% of households owned a single car or van, with 31.05% owning none. The average car ownership per household was 1.01, compared with 0.96 across the West Midlands metropolitan county. The table below details the population change in the area since 1801. Although the Metropolitan Borough of Walsall has existed as a metropolitan borough only since 1974, figures have been generated by combining data from the towns, villages, and civil parishes that would later be constituent parts of the borough. At the time of the 2001 census, there were 105,590 people (41.7%) in employment who were resident within Walsall Metropolitan Borough. Of these, 18.60% worked within the wholesale and retail trade, including repair of motor vehicles; 26.44% worked within manufacturing industry; and 9.85% worked within the health and social work sector. At the 2001 UK census, Walsall Metropolitan Borough had 180,623 residents aged 16 to 74. 2.3% of these people were students with jobs, 6.0% looking after home or family, 6.8% permanently sick or disabled and 2.4% economically inactive for other reasons. These figures are roughly in line with the averages for England, though Metropolitan Borough of Walsall has a higher rate of people who are permanently sick and disabled, where the national average is 5.3%. The Metropolitan Borough of Walsall is split between several Travel to Work Areas (TTWA). The central and northern areas of the borough (including the towns of Walsall, Bloxwich and Brownhills) are within the Walsall and Cannock TTWA, whilst the majority of the area west of the M6 motorway (including the towns of Willenhall and Darlaston) is within the Wolverhampton TTWA. The southeast of the Metropolitan Borough (including Streetly) is within the Birmingham TTWA. The entire borough is within the Birmingham Larger Urban Zone. Average house prices in the Metropolitan Borough of Walsall were fourth out of the metropolitan boroughs in the West Midlands county, with the average house price within the borough being £131,131 during the period April – June 2009, compared with the average across the Metropolitan County of £128,142. The A34 trunk road runs directly through the middle of Walsall . An elevated section of the M6 Motorway built in 1968 half circles around Walsall to the West of the town. There can be increased congestion on the local A roads whenever the motorway is temporarily closed or in a state of serious delay as road users try to bypass the problem. Junctions (North to South) 11, 10, 9 and 7 allow access to and from various parts of the town. The M6 and M5 join at junction 8. The A454 runs through Walsall on its way to Sutton Coldfield from Bridgnorth. 45% of pupils in the Borough of Walsall achieved five GCSEs with grades of A*-C, below the national average of 56%. The borough's education format is a traditional 5–7 infant, 7–11 junior and 11-16/18 secondary school system, with some infant and junior schools being combined single site primary schools, while others have infant and junior schools on separate sites. The towns of Walsall, Bloxwich, Darlaston and Willenhall have always used these age ranges, but the Aldridge, Brownhills and Streetly areas (which became part of the Metropolitan Borough of Walsall in 1974) adopted 5–9 first, 9–13 middle and 13-16/18 secondary schools in September 1972. However, this system was discontinued and replaced with the traditional age ranges in September 1986 to fit in with the other schools in the Walsall borough. ^ "Walsall Metropolitan Borough resident population estimates by ethnic group (percentages) 2005 estimate". Statistics.gov.uk. Retrieved 22 October 2009. ^ "The Hereford and Worcester, Staffordshire and West Midlands (County and Metropolitan Borough Boundaries) Order 1993". Office of Public Sector Information. 20 September 2000. Retrieved 20 January 2008. ^ "Walsall South constituency election results". London: Guardian.co.uk. Retrieved 22 October 2009. ^ "Aldridge-Brownhills constituency election results". London: Guardian.co.uk. Retrieved 22 October 2009. ^ "UK MEPs". Europarl.org.uk. Retrieved 22 October 2009. ^ "Walsall local elections 2008". London: BBC Online. 2 May 2008. Retrieved 22 October 2009. ^ "England council elections". BBC News Online. 10 May 2011. Retrieved 24 September 2011. ^ "Walsall Metropolitan Borough". Vision of Britain. Retrieved 23 October 2009. ^ "UK House prices – West Midlands". London: BBC News Online. 16 March 2010. Retrieved 4 December 2009. ^ "Lindens Primary School". Archived from the original on 28 February 2012. Retrieved 20 October 2009. This page was last edited on 1 March 2019, at 19:45 (UTC).